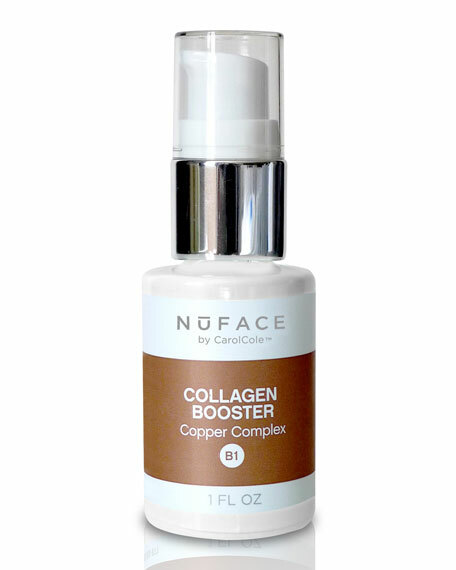 The NuFACE Collagen Booster with Copper Complex stimulates collagen formulation for maximum firming and tightening of skin. Restores a natural glow and suppleness to aging or lackluster skin, helping to improve and promote an even complexion. Ideal for Beauty seekers who want to regenerate skin-thickness and density. Safe enough to use around the eye area, making for a perfect wrinkle-reduction eye serum. Active ingredients: Hydrocotyl and Coneflower Extract help improve and maintain the skins' suppleness by increasing skin firmness and density; copper plays an essential role within the fibroblasts to promote healing. Contains no artificial dyes; the blue hue is a property of the copper complex. 1. Apply evenly over the entire face, neck and décolleté area. 2. Tap into the skin with fingertips. Ideal for use around the eye and mouth areas. 3. Safe to use alone, and to apply to skin after other serums. 4. 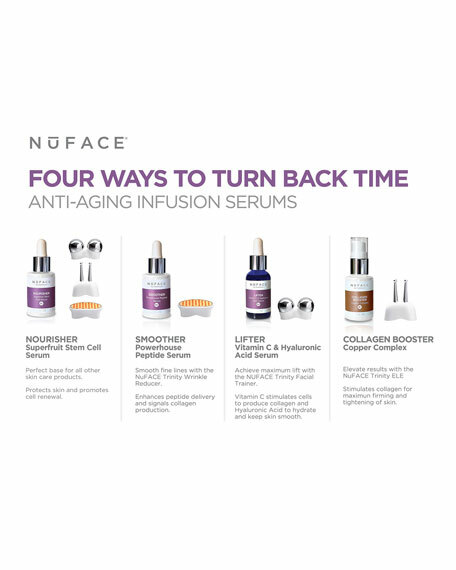 For deeper product penetration, use before your NuFACE Microcurrent Treatment.